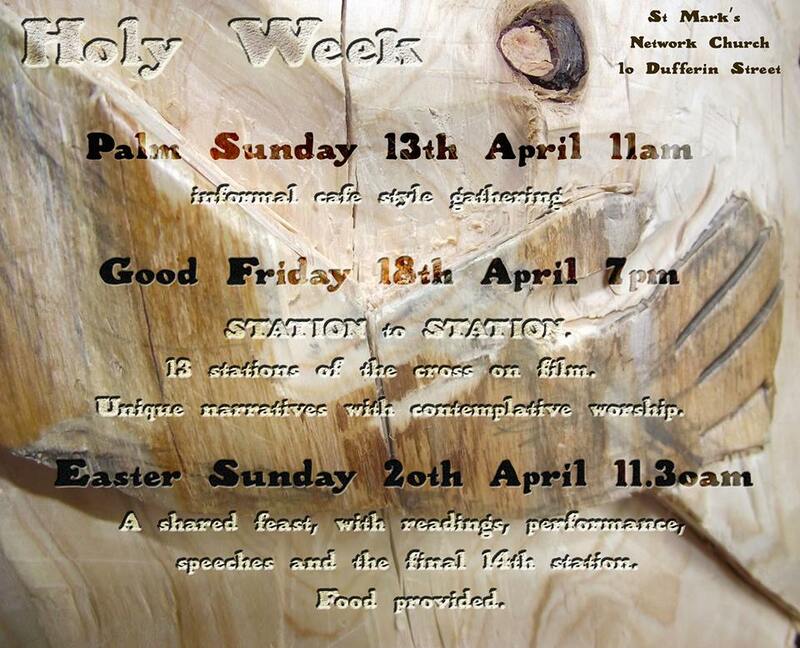 We’re now in Holy Week, where Lent morphs into Easter. In my house we’ll continue lighting our Lenten candles and saying the sentences about Jesus that go with them, but there are plenty of other special things coming along this week that can take their own place in household spirituality. So here’s a bunch of ideas for how you can bring out the meaning of the week for kids of all ages. It’s a fairly arbitrary list and I bet you’ll be able to add to it – so please do so in the comments below. Let me say, right at the start: just pick one! Or two or three – but not 32, ok? This isn’t a To Do list, it’s a smorgasbord of options to make life a little easier as you celebrate Easter with the kids in your life. Give thanks. Take turns saying what you’re most grateful for this Easter. If you’d like some memorable structure to this, you could start a Gratitude Wall. Invite someone for a meal. Easter is about God’s extravagant love to humanity. Share some of it around to someone who could use the company and friendship. Incorporate Easter symbols in your meals. I’ve collected a bunch of ideas on my Easter Pinterest board – how handy! Tell baptism stories. Easter is traditionally the time new people are brought into full church membership through baptism (though it often doesn’t work this way in modern churches). You could start an Easter tradition of each person present telling a story of their own baptism or even of other people’s you have witnessed. Remember that kids won’t even know you’ve been baptised if you don’t tell them out loud, in words! Buy new clothes. If you would be buying a winter coat or summer swimming gear around this time anyway, make it a big deal that Easter is a time for new clothes. Maybe you could all go to a charity shop/op shop together to pick out new things, to participate in the ‘resurrection’ of pre-loved clothes? Review responsibilities. Is your eight-year-old ready for the challenge of cooking dinner of doing the grocery shopping online? Would someone like to swap from recycling to vacuuming as a weekly responsibility? What other things do you tend to decide on together at family meetings? I’d love to hear your experiences, so please leave a comment below. Depending on where you live, different things will be on offer, including plenty of special services at churches you don’t normally attend. This is a great time of year to branch out and accept the hospitality of other congregations and benefit from the wisdom of different traditions. Google is your friend. For any of the ideas below, plug the title into a search engine and see what’s on offer near you. Footwashing service: Anglican and other churches often do these on Thursday nights. Stripping of the Altar: usually on Thursday night, often as part of another service. Tenebrae/Service of the Shadows: Thursday night, Friday morning or Saturday night are most usual, but just google these phrases for local services. Seder/Passover dinner: perhaps with Jewish friends or someone from your local Jewish community centre. Roman Catholic Good Friday mass, at 3pm anywhere in the world. Ecumenical Walk for Justice, also on Good Friday around the world. Plug the phrase into Google to see who’s gathering in your part of the world. Easter Vigil on Saturday night. Check your local Cathedral or other major church for other special offerings. Hold an Easter Feast on Sunday. Invite someone who needs it. Visit the nearest Easter Camp for young people, whatever age you are. Pop into one of the sessions and see what youthful spirituality is like these days :). There are lots of things to do and make. Pinterest has dozens of great ideas if these don’t grab you. The Martha Stewart guide to dyeing Easter eggs! Hot cross buns: breadmaker fruit or chocolate versions; Alison Holst’s classic ones. Easter egg-shaped cookies: steal the idea and use any recipe you like, especially if you have special diets to cater for. Resurrection rolls: very popular in North America, but I admit I have no idea what some of these ingredients are! Maybe someone can enlighten us as to how to make this kind of thing from scratch? Chocolate rice crispy nests: also good for catering for allergies. If you have a good Christian book shop near you, perhaps Easter could be a good time for a trip there all together. Pick some music to play on the stereo in the lounge, or a book to read together at bedtime, or give each person a bit of cash to choose something of their very own. If you have a bit of spare money, maybe you could give a struggling household a few envelopes of cash for that kind of shopping trip. Walk a prayer labyrinth if there’s one nearby (just Google it), or do your own three-part version walking around your neighbourhood. Bring new life to your local area by doing some tree-planting or rubbish-collecting. Ok, what’s number 33? What have you done to celebrate the week’s events with kids that has been memorable or fun or helpful (or – holy grail – all three!)? Please do leave a comment below with your ideas and feedback. Thanks! 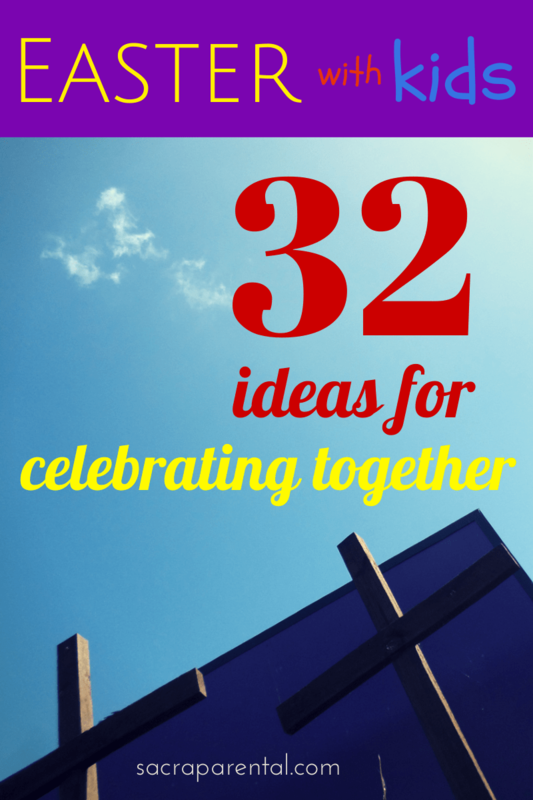 Check out my Easter and Lent Pinterest boards for more ideas – though possibly you (like me) should stop searching and start just doing something that’s already on our horizon from this list or elsewhere :). And you are warmly invited to visit the Sacraparental Facebook page for daily extras and interactions. Lastly, you might like to check out this introduction to Easter I wrote for a non-churchy audience last year at Kiwi Families. Upon re-reading it this week, I found I was quite proud of it! The rolls in the ingredients in the ‘resurrection rolls’ are unbaked croissants (although I think the ‘dinner roll’ ones might be less fatty than actual croissants). In the US you can buy them in a can in the frozens section of the supermarket then peel the long triangles off the roll of pastry in the can, roll then up to form croissants and bake them. In NZ, I’d use flaky pastry (cut into rectangles and then wrapped around the marshmallow) for the same effect. If you wanted to be extra-yummy, ‘Panneton’ sells unbaked croissants that you could tuck a marshmallow into and then bake. I’ve seen them in the frozens section of fancy deli-type supermarkets in Auckland like Farros/Nosh.